Cold sores are a contagious disease caused by herpes simplex virus type 1 (HSV-1). Patients infected with the herpes simplex virus type 1 usually have painful sores on the lips, but the infection can also affect the gingiva, pharynx, tongue, roof of the mouth, inside the cheeks and sometimes the face the neck. 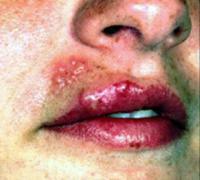 Cold sores are an infection of the mouth and lips caused by a virus called herpes simplex virus type 1. Their injuries are typical and are characterized by small grouped blisters that appear on the infected patient's lip. These blisters are painful and will break down after a few days, leaving small scabs instead.